After you've created and populated at least one question bank in your project, you can draw questions from the bank into any scene in your story. This is called a question draw. In this tutorial, we'll look at how to add and edit question draws in Storyline. Note: You can create multiple question draws from the same question bank if you wish, which means you can use the same questions more than once in the same story. 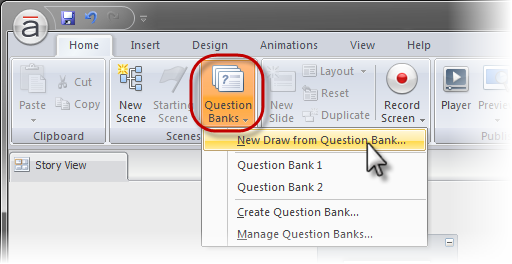 In Story View, go to the Home tab, click the Question Banks drop-down list, and then select New Draw from Question Bank. 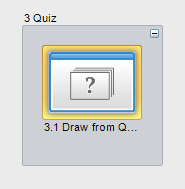 Or, open the Insert Slides dialog, and select the Quizzing tab on the left. Then select the Draw From Bank tab at the top of the window. 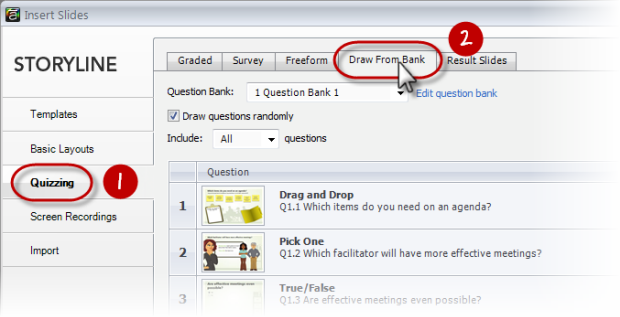 Use the Question Bank drop-down list to select the bank from which you want to draw your questions. If you need to modify the questions in the question bank first, click the Edit Question Bank hyperlink next to the Question Bank drop-down list. 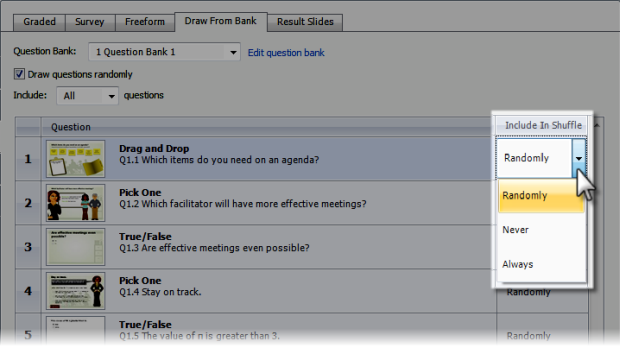 Refer to this tutorial for question bank options, such as adding, editing, deleting, moving, and locking questions. If you want the questions to display in a random order in the published story, select the Draw Questions Randomly check box. Use the Include In Shuffle column to specify, for each question, whether the question will be Randomly displayed (which is the default option), Never displayed, or Always displayed. Use the Lock Question button at the bottom of the window to lock the selected question or content slide in a specific location. This affects how the questions will be shuffled (if you choose to randomize the questions when you draw them into your story). You can lock a slide To Question Above / Below or To Top / Bottom of Group. You can also choose to Remove Lock if you change your mind. 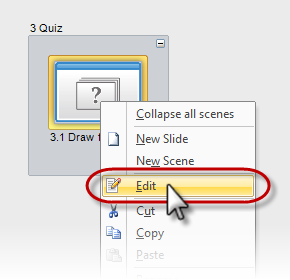 If you need to change the parameters for an existing question draw, such as randomization, how many questions will be included, how they will be shuffled, or the order in which they will appear, click the top half of the placeholder slide where it says, “Click to view the slide draw”. Tip: You can also change the parameters for an existing question draw when you are in Story View by right-clicking the placeholder thumbnail and selecting Edit from the shortcut menu that appears. On the other hand, if you need to edit the source question bank from which the questions will be drawn (by adding, editing, deleting, moving, or locking questions), click the bottom half of the slide where it says, “Click to view the question bank”. 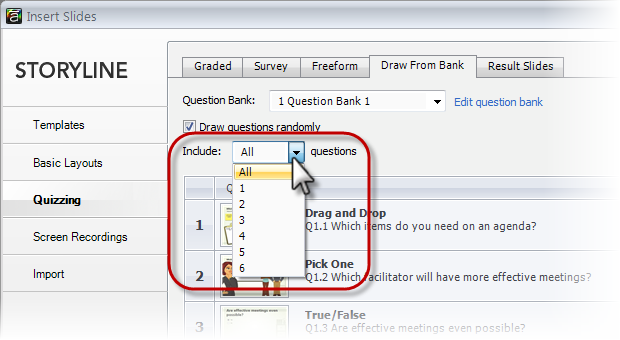 Refer to this tutorial for question bank options, such as adding, editing, deleting, moving, and locking questions.